Swim with Whale Sharks or Humpback Whales - the largest fish in the world with the most experienced tour operator in Exmouth! Our Whale Shark Snorkel Tours run 7 days a week, from the 15th of March to the end of August 2019. Come and join us for an exhilarating day out snorkelling and swimming with Whale Sharks or Humpback Whales - the largest fish in the world and an array of marine life! Or just sit back and enjoy the views with a glass of champagne on the Ningaloo reef off the coast of Exmouth. Ningaloo Blue has a 65 foot state of the art vessel, which is 2 storey with a huge under cover lower deck with comfortable seating and easy access to marlin board at water level. Then we have a huge upper deck for observation and sun bathing.. Swim with the Whale Sharks are from April - July and the Humpbacks from August - November. Whoever you swim with, you will be blown away by the sheer beauty of these giants of the sea. No show policy, if you don’t see a Whale Shark go again for FREE! 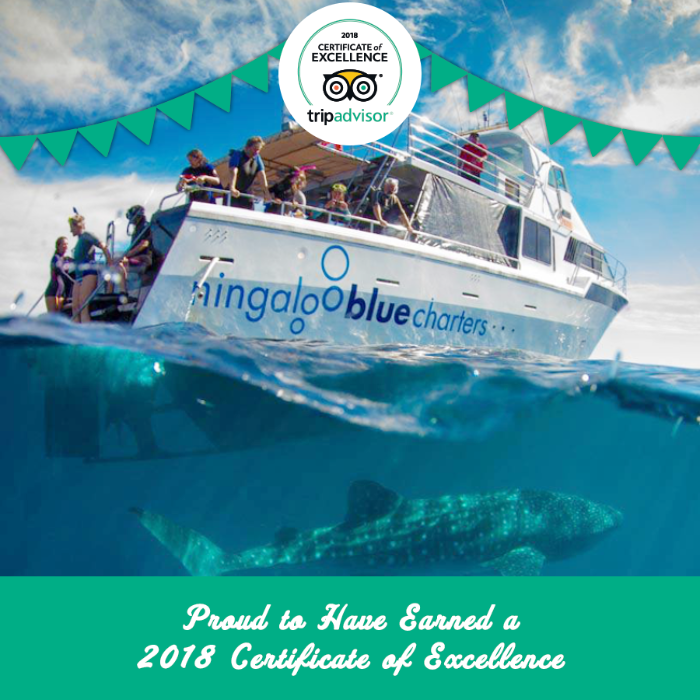 Complimentary gift pack - includes certificate stating the day and date you swam with your first Whale Shark & a cool Ningaloo Blue Dive sticker.